There are many different kinds of water purifiers available in India today. Water purifiers can be from just a simple water filter with filter cartridge element to the more advanced water purifiers using membranes for water filtration followed by sterilisation with UV filter. We explain how different types of water purifiers work and once you understand how water purifiers work it is easy to decide on which type of water purifier to buy. For most houses in India supplied with Municipal or Corporation water, just a simple cheap water purifier with a cartridge is the cheapest and best solution. Cheap water filters are just very fine sieves through which when the water passes through, solid particles bigger than the size of the sieve holes or pores gets trapped and filtered out of the water. Modern day water filters using the sieving method must have evolved from the Middle Ages, when pieces of cloth were used by people to filter their drinking water from river, pond, well or rain water. During this filtration process through cloth, when the cloth got dirty and clogged, they would have rinsed the cloth clean and reused it. The same way most of these cheap water filter cartridges can be washed and reused. Water filtration still depends on passing the water through fine pores or holes, only now the pore sizes have become very much smaller. The size of the pores or holes in a cloth is very large when compared to modern day filter media. While the pore size of the cloth would be measured in fractions of a mm or millimeter (1/1,000 or 0.001 Meter) a modern day water filter pore size is measured in Microns or a micrometer normally written as μm = 1 by a million or 0.000001 Meter. That is about a thousand times smaller the pore size of plain cloth. The smaller size of the pores means that it is more difficult for the water to pass through them, hence the water needs more pressure to pass through the smaller pores. In the case of gravity water filters the pressure is low, which means the flow of water will be less, and so in gravity water filters the water is filtered almost drop by drop and it will take a long time to filter water. When the pores of the water filter are small, more dirt gets filtered out, and hence smaller pore sized filters gets clogged and blocked more easily. Selecting a water purifier in India for house depends on the quality of water you get in the house. As explained above there are different water purification technologies and selecting which type of water purifier is best depends on the type of water or impurities in water that is there in the house. Below we will explain how different kinds of water purifiers work to help in deciding which kind of water purifier is best in India. The first stage of water purification in all home water purifiers is to get rid of the larger solid particles like mud and dirt with a sediment filter. 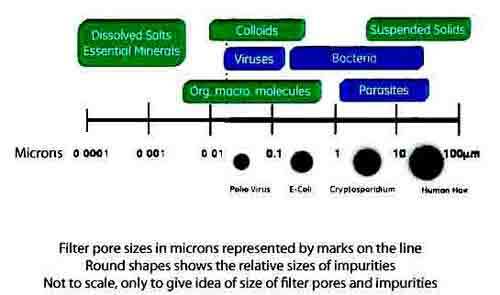 Pore size of the sediment filter is usually 20 microns. If the water contains a lot of mud or other larger particles, then this cartridge element becomes blocked quickly. It can be removed, cleaned by jetting with water and reused. It is like a cloth being reused after rinsing. The second stage in a home multi stage water purifier is a finer filter with pore size varying from 5 microns down to 1 micron or even less. These fine pore water filters removes larger germs like parasites. The smaller the pore size, the more efficient it will be in removing microbes and germs from water. The disadvantage of having very small size pore water filter is that a higher water pressure will be required to drive the water through. If the pressure is not sufficient, the water coming out of the filter will be very slow. Since multi stage home water purifiers usually have a germ killing devise like UV (Ultra Violet) at the last stage of the multi stage water purifier, any germs passing through the finer filter will be killed later. So a compromise is made by having a 5 micron second stage filter cartridge. The fourth stage will normally be a germs killing devise, usually a UV water purifier which has UV light to kill any remaining germs in the water. Some water purifier manufacturers call UV water purification as 'e-boiling' - See our page on Ultraviolet UV water filters. Other methods in the final stage to kill germs could be by passing water through special media which release chlorine, or through media with nano-silver particles. The filtration stages 1 to 3 described above can be as separate filtration units one after the other or it is possible to combine all stages into one filter cartridge by having the different media one under the other, so that the water flows through each media. As the filter removes the particles from the water, their pores are getting blocked and water pressure is being lost. This means over time the flow out of the filter becomes slower and slower until it almost stops. The time it takes for the filter to become blocked depends on how much dirt there is in the water. Most water purifiers have replaceable filter elements called cartridges, and it is a simple procedure to change cartridges. Once cartridges are replaced, the flow will be restored. Home water purifiers with RO are now the most popular water purifier in India. RO or reverse Osmosis water purifiers use RO membranes to purify water. There are other types of membranes for water purification but RO water purifier is the most popular in India. Other types of membranes in water purifiers are Ultrafiltration UF membrane water purifiers which can remove all bacteria, virus from the water but not any dissolved chemical impurities in water. Then there is Nanofiltration NF membrane water purifiers that removes everything that the UF water purifier removes (bacteria and Viruses) plus it also removes larger molecule salts in water, like Calcium and Magnesium and some of the Heavy Metal salts. Salts like sodium Chloride remain in the water in a NF water purifier. NF water purifier is capable of softening water. Finally there is the Reverse Osmosis RO water purifier which removes all impurities in water – virus, bacteria and all salts. So RO water purifier is the best type of water purifier available in India for drinking water.